I am excited to offer you this preview of the Dale Chihuly 2018 Studio Editions. Each year I feel that the new offerings of these gem-like smaller versions of Chihuly’s signature series have outdone those from previous years. This year’s Studio Editions are no exception. Please call or email me for further information. 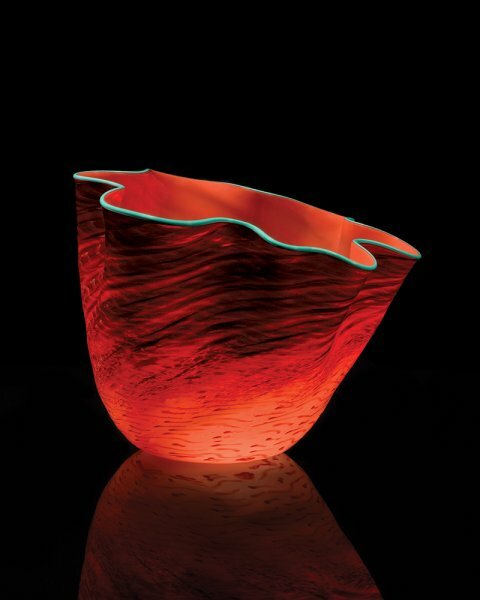 Tuscan Red Seaform by Dale Chihuly, approx. 6" x 7.5" x 7.5"
The charged red palette of the 2018 Studio Edition Tuscan Red Seaform transitions from deep burgundy to a burnished, fiery red-orange and revisits aesthetics found in Chihuly’s earlier Seaforms. Varying shades of red body wrap sweep across the surface of the form, which is then twisted and capped with a teal green lip wrap. 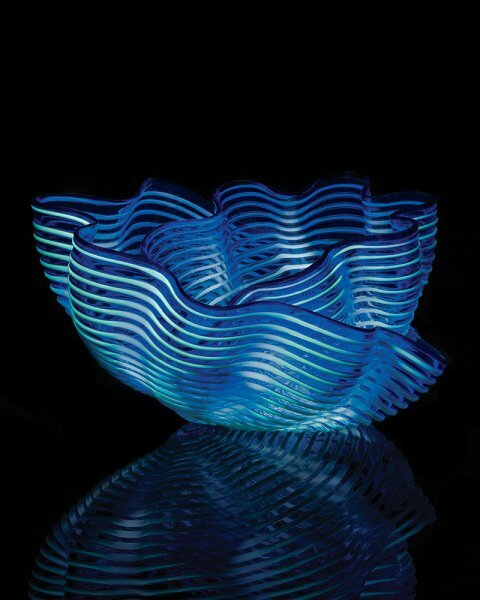 Capri Blue Seaform by Dale Chihuly, approx. 7" x 10" x 8"
The sensual and fluent waves of the two-piece composition Capri Blue Seaform, a 2018 Studio Edition, intensify the play of shadow and light between the ripples of the body. Contrasting tones of transparent and opaque blue harmonize to create an immersive, optical aura that is at once organic and transcendent. Ivory Luster Basket by Dale Chihuly, approx. 8.5" x 9.5" x 9.5"
The 2018 Studio Edition Ivory Luster Basket, a strong statement in its simplicity, embodies the ephemeral, amorphous, and free-form attributes for which Chihuly’s forty-year-old Basket series is known. A thin veil of glass creates a spacious interior in which rest two smaller Basket elements, each varying in degrees of translucency and opacity. 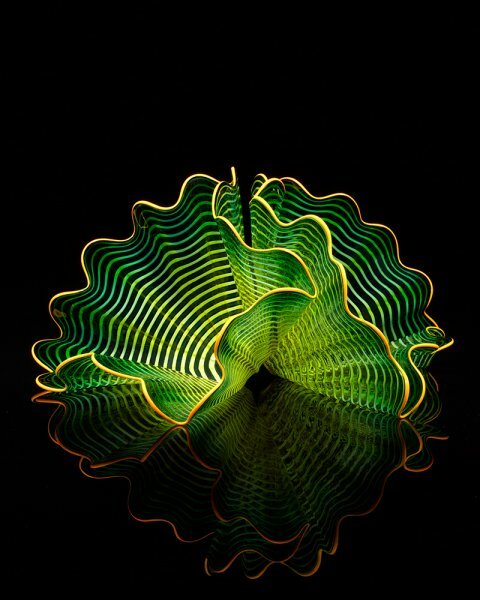 Laguna Persian by Dale Chihuly, approx. 6.5" x 11" x 6"
Composed of two abstract and beguiling elements, the 2018 Studio Edition Laguna Persian communicates an ancient sensibility through a contemporary form. Bathed in lush emerald green, the artwork’s undulating waves are wound with a sinuous body wrap of golden amber, chartreuse, and oxblood red to reveal an internal candescence and inviting contrast. 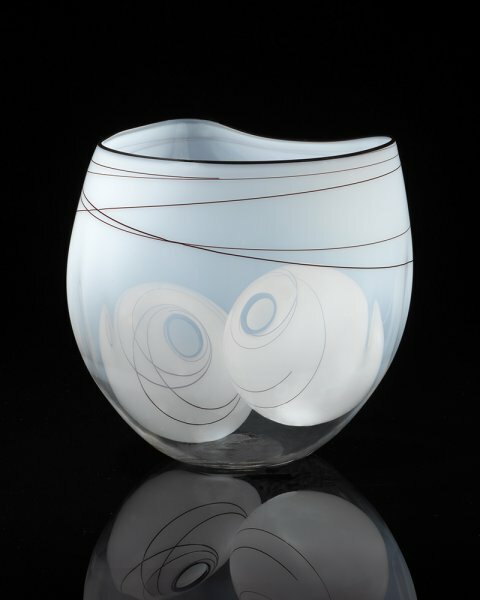 I hope you have enjoyed viewing these dynamic new glass sculptures and I look forward to being in touch!